Traditional thatched cottage, four bedrooms, two bathrooms, garden. 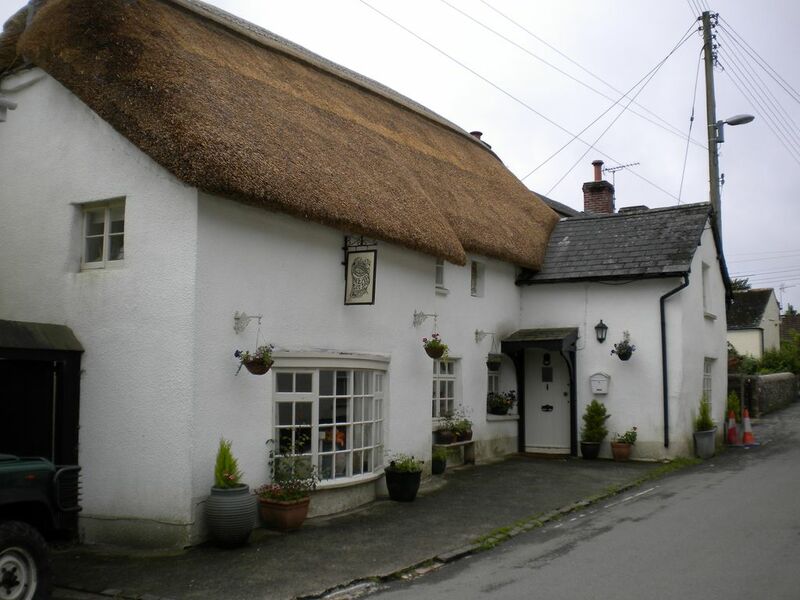 Mead cottage is a beautiful, traditional, thatched cottage set in the heart of this charming Devon village. It is located in the oldest part of the village near the square, the church and the village shop with two welcoming pubs within walking distance both serving good food. Dolton must be one of the friendliest and laid back villages in Devon but that's no surprise when you consider it's location nestled into the Devon countryside with glorious walks nearby, the Tarka trail, Dartmoor, RHS Rosemoor, The Plough arts centre, Bideford, Appledore and the stunning beach at Westward Ho! all only a short drive away. The wonderful historic city of Exeter with its cathedral, shops and fine dining is only 45 minutes away too and Bude and the Cornish coast less than an hour. Mead cottage is 17century and one of the oldest in the village datimg back to 1646. This well presented cottage is cosy and welcoming yet spacious and rambling and it wraps you in it's warmth like a favourite wooly jumper. The enclosed garden at the back is pretty and private with a vine covered terrace for outdoor dining. The cottage is spacious and light with beams, farmhouse kitchen with Aga , sitting room, dining room, study, four bedrooms, one en suite, separate cloakroom and family bathroom, utility, barn,summer house and barbecue area. It is my home for most of the year and is therefore very comfortable and well equipped. Parking for one car is on the front forecourt of the cottage with free parking also on the square or roadside. The cottage is unsuitable for wheelchair users as there are stairs to the bedrooms and small children should be accompanied in the garden as there is a small ornamental pond. Pets are not allowed. Mead Cottage is available for hire for holidays for periods in multiples of one week from 4:00pm on Saturday to 11:00am on the following Saturday. There is no extra charge for electricity, gas or for WiFi. Each spring and summer I like to go back to the Tarn et Garonne to visit old friends so Mead cottage is available then. If there are other weeks you require then please ask and I may be able to accommodate you. Claudie, my elderly cat, lives at Mead cottage and spends most of the time snoring gently on a cushion in front of the Aga or in the garden shed if it's sunny. If you have no allergies or objections then he will remain during your stay in the hope that you will feed him and be kind to him (food provided) but if you would rather not then I will arrange a cattery for him. If you have any queries or special requests then please contact me and I will do my best to answer or provide. Landline for local and emergency calls. Electric and a gas fire. Not available in summer months because of high risk to thatch so not covered by the insurers for lets. Freeview TV. DVD player and some films. Large sofa plus small chesterfield and armchairs, lots of books. Under counter fridge in kitchen and fridge freezer in barn. Fan assisted electric and/or Aga. Too many to list but everything you could need I think. An Aga is at the heart of the kitchen for both cooking and hot water except in very hot weather. There is also a fan assisted electric oven,hob, dishwasher, microwave and fridge. Large table and chairs with glasses cabinet and long side cupboard full of wine glasses, napkins, cutlery, dinner service and dishes. Gas fire. TV and Satbox in large back bedroom. No wifi in this room, walls too thick but wifi in all other bedrooms and downstairs. Table and chairs for outdoor dining, sun umbrella. pond not covered steps everywhere not child friendly . not really 2 bathroom as bath take 2 hours to fill and cannot use shower as no curtain told on day of arrival not to use upstairs toilet except for a pee or we would have to pay for plumber to repair not ideal when there are 8 of us would not stay there again. owner deducted £40 for 2 outside mats that where wet rained most days what did she think would happen ? kitchen dirty had to clean all pots and pans first says it has an Aga cooker but not available for us had to use oven and hob but was right in the walk way so was dangerous . Astonished at the review above since the renters assured me they'd had a lovely time. I wish they had spoken to me about their issues and particularly about the damage. The door mats, one in,one out had been left under the down pipe so that the rain water from the roof ran over them. It seems someone had stepped in dog mess so it was an attempt at cleaning them which failed. They had to be replaced. A shelf in the bathroom had been removed because the bracket had been pulled from the wall. Again this had to be repaired for the next renter. Also I later discovered the roller blind in the small bathroom had been pulled off and was down the side of the bed. Someone in the group smoked. Not only was there a smell bit cigarette butts in the kitchen bin and outside the front door. The ensuite bath does not take two hours to fill and there is no shower in that bathroom. Its a mixer attachment to wash hair. The saniflo toilet was explained carefully so that only toilet tissue was put in it, a bin provided for wet wipes, etc. I pointed out that anything hard was put down the toilet it could damage it and would be their responsibility. The Aga isn't lit in summer, it would be much too hot. The renters said they'd never used one anyway and were happy with the hob and fan assisted oven. I don't understand the comment about it being dangerous. I don't believe pots and land were dirty since everything goes through the dishwasher. I believe the renters were angry about being charged for damage and are lashing out in their review. It seems that they were rather a large party, apparently one slept on the sofa. These were the first renters from owners direct. All other renters have loved the cottage and I have never had to deduct money for damages. I would suggest checking the reviews for Mead Cottage on Air B and B which are all positive and also from families with young children who were delighted with the facilities and certainly didn't find it unsuitable for children. Given the response from the renters I would neither welcome them back nor recommend them to other hosts. Westward Ho! has the most amazing beach for wind surfing, para gliding or just walking and sunbathing. Exmoor Zoo is a drive away and the steam train ride, Lynton and Lynmouth hiilside railway and The Valley of the Rocks with it's wild goats, stunning walks and beautiful cricket pitch. Appledore and Instow are stunning little harbour villages with Tapely Park a must for it's historic house and grounds. Bideford and the historic quay with a boat trip to Lundy island and Barnstaple for shopping and Tarka trail along the estuary to Fremington Quay. All these can be reached by a jolly bus ride from Dolton if you don't feel like driving.